If you want to invest in big-cap companies that offer organic growth and dividend payments, then you might want to look at this consumer products juggernaut. Unilever's (NYSE:UL) has long held the slogan "Feel good, look good, and get more out of life". This slogan relates to the company's extremely broad product portfolio, which includes Degree, Hellmann's, Axe, Lipton, Ben & Jerry's, and Vaseline. If you combine all of Unilever's products, they're used by 2 billion people per day. If that's not brand recognition, then I don't know what is. Once a company's brands become recognizable, it usually means it will always have a ton of value. But with the global economy on shaky ground, and increased competition leading to a highly promotional environment, nothing is guaranteed. Forget the third quarter for a minute, and let's look at the bigger picture. Year-to-date sales increased 4.4% year over year, with emerging-market sales jumping 8.8%. Volume grew at a 2.4% clip, and pricing saw a 1.9% increase. In the third quarter, sales improved 3.2%, with emerging-market sales receiving a 5.9% bump. Volume grew 1.9%, and pricing increased 1.3%. Emerging markets remain the key growth driver. Developed markets have been weak, and Unilever stated that North America and Europe have been flat to down with no signs of improvement. You have to love a company that doesn't sugarcoat the situation. In the third quarter, sales in developed markets dropped 0.3%, yet Unilever owns it. This indicates that Unilever knows it can overcome this headwind and it's a very transparent company. Considering the way it treats its employees -- one of the best in this area -- it's very likely to be an open and honest organization. The whole operation is based on treating employees well so they produce more, and it has been highly effective since 1885. You can think of Unilever as the antithesis of Wal-Mart. This alone might drive some to invest in Unilever. Looking ahead to the fourth quarter, Unilever expects innovations to improve sales. So now, let's take a look at the American version of Unilever. Are household brand names leaving the house? Procter & Gamble (NYSE:PG) is well-known for its brand names, including Crest, Oral-B, Vicks, Ace, Downy, Duracell, Febreeze, Tide, and more. The big concern with Procter & Gamble is that the American consumer has become more value-conscious, which means they might not be as willing to pay up for premium brands. This is a logical argument, but people are creatures of habit, and they don't like change, even if it costs them an extra dollar or two. Most consumers who purchase Procter & Gamble products aren't suddenly going to switch to generic brands. And if they do, they might quickly realize that they have taken a step down in quality. If you're not a believer in this theory, then consider the 4% jump in organic sales in the company's most-recent quarter. If that's not enough to fuel at least a little optimism, then also consider that Procter & Gamble expects full-year organic sales of 3% to 4% and earnings-per-share growth of 5% to 7% (excluding restructuring charges). Yet, there's another company in the personal products space you should consider. Foolish investors don't focus on short to medium-term stock price fluctuations. Instead, they look at the strength of the underlying company, and determine whether or not it's worthy of an investment. However, the past five years have presented a highly challenging consumer environment, which has led to the need for management creativity. The bull market has definitely played a role in taking most stocks higher, but you should also pay attention to the companies that have outperformed its peers. And this trend should continue. In the third quarter, Colgate-Palmolive's net sales increased 1.5% year over year, with global unit volume spiking 5%, pricing moving north by 1%, and organic sales improving by an impressive 6%. Looking ahead, Colgate-Palmolive expects EPS to grow at 4.5% to 5.5% for the year. And it expects its 2014 fiscal year to see continued momentum with double-digit EPS growth along with gross margin expansion. All three companies give investors a reason to be optimistic. In addition, all three companies offer compelling yields. Currently, Unilever offers the highest yield at a generous 3.50%. Procter & Gamble isn't far behind at 3.00%. And Colgate-Palmolive is currently yielding 2.20%. The one negative for Colgate-Palmolive is that it sports a debt-to-equity ratio of 3.12, much higher than Unilever at 1.19, and Procter & Gamble at 0.46. All three companies are seeing organic growth. But if you're looking for a high dividend, Unilever will be your best option. If you want to go with a company that's constantly cutting costs in order to improve its bottom line while also offering a multitude of household brand names, take a look at Procter & Gamble. And if you want to stick with the top performer and you don't mind leverage, then Colgate-Palmolive might be the best option for you. 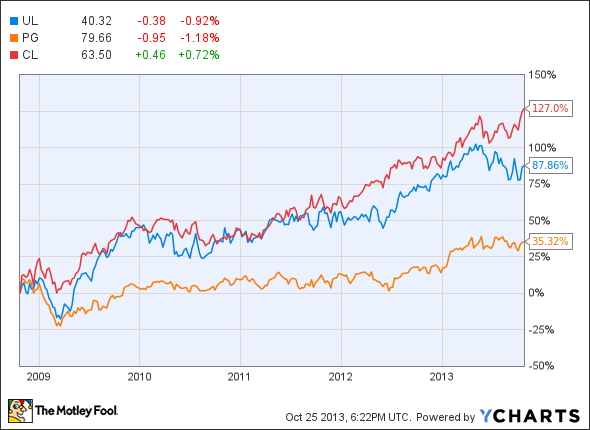 The bottom line is all three companies all likely to remain long-term winners. As always, Foolish investors should do their own research before making any investment decisions.